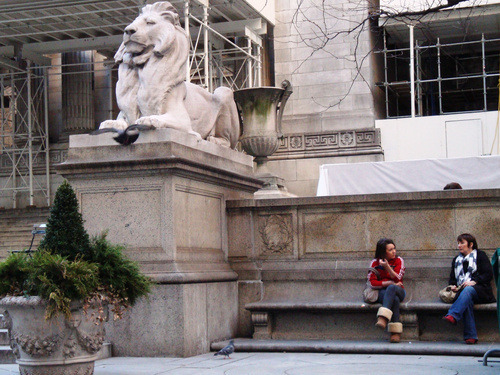 Beneath Patience and Fortitude, the regal lions of the New York Public Library, are two marble benches that frame the iconic building (which is currently undergoing a cleaning and renovation of its facade). 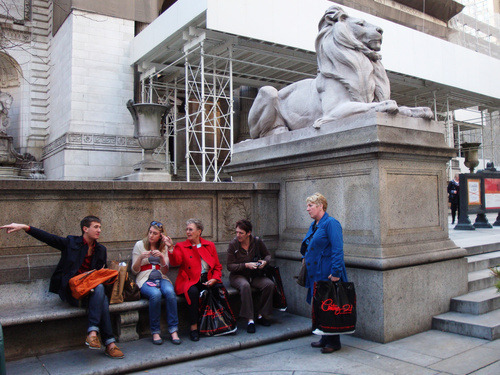 The benches, popular rest spots for passengers awaiting the buses that travel down Fifth Avenue, were claimed by Yoko Ono during the Bryant Park Benchmarks Fundraising Campaign in 1995. Well known for her marriage to legendary musician John Lennon, Ono is a prominent artist, musician, filmmaker, peace activist, and philanthropist. Her Benchmarks story is a short one. After Ono made donations for the twin benches, one in her name and one in the name of her son, Sean Ono Lennon, we lost contact with her. Many requests were made by the Benchmarks Campaign organizer for the text Ono wished to have engraved on her plaques, but a response was never received. Subsequently, the benches were left bare, but Ono’s generous donations gave her the rights to have personalized plaques at both those locations. Should she ever call, we will happily engrave two plaques to adorn her benches.